Get the most out of your equipment budget. Many innovative ideas and products are changing the dynamic of the construction industry. One of these innovative ideas is the hook lift or multi-purpose truck. A hook lift is an attachment on a truck that basically transforms the truck into a multi-purpose tool. The hook lift allows multiple trucks to be combined into one by enabling the truck to change bodies as needed. Mounting and dismounting of the body is quick and simple. First, the operator backs up toward the body and hooks the body with the hook lift. With the slight adjustment of a shift, the hook lift uses low-pressure hydraulics to power the body onto the chassis of the truck. Beveled rollers center the body through the chassis locks until it is securely attached to be able to drive with. Another innovative product in the construction industry is a mobile concrete mixer driven by decades of advanced technology and engineering is the perfect partner for hook lift trucks. Check out this video which shows how easy it is to load and unload a mobile concrete mixer. The Hook Lift Hoist System in the video below is from Swaploader. 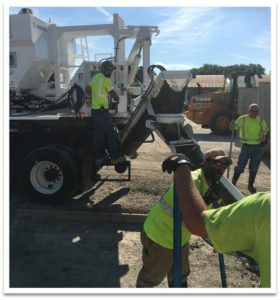 Pour concrete on demand – when and where you need it, decreases downtime or employees waiting for concrete delivery. Precise admix design – maximum results with every pour, admixtures can even be changed on the fly as needed. Eliminate waste – no overages or shortages cuts wasted dollars. Versatile – Outstanding performance and durability, flexibility for multiple applications. With these great benefits, mobile mixers still do not sacrifice their concrete quality with an accuracy of +/-1%. Concrete mixed on the job site ensures the mix design meets quality and quantity standards. The hook lift and volumetric concrete mixer are clearly two compatible products. The hook lift can utilize many more body attachments besides the mobile concrete mixer. The hook lift falls under the category of one size fits all and has a variety of attachments including flatbeds, dump trucks, plows, and hot patchers to name a few. The hook lift can switch attachments very quickly, and that opens the door for many opportunities based on seasonal or job needs. For example, a city may be repairing streets, curbs and doing concrete pours in the warmer months and needs to utilize the same truck in a sand/plow configuration in the winter. These can be done with one truck with a hook lift and eliminate the need to purchase multiple trucks. Or you may be using the mobile mixer to pour concrete for street repairs and then a need arises for use of a skid loader. The truck utilizing the hook lift is able to switch attachments to a flatbed to carry the skid loader back to the construction site. This truck can then switch attachments again to use a dump truck for the waste materials that the skid loader was needed for or the truck can simply attach the mobile concrete mixer to continue pouring concrete. The hook lift can resolve any problem that occurs if the correct attachments are readily available. Many attachments that a hook lift can use are related to mobile mixers in some form. For example if a storm knocks down multiple telephone poles, then a single truck can be used to fix them. The mobile concrete mixer can be used to fill in the holes to stand the telephone poles back up. After this, the utility basket body attachment can be used to inspect the telephone wires. If the wires are damaged in any way, they can be mended with the same truck that was filling in the holes of the telephone poles with concrete. With the many attachments that are related to the mobile concrete mixer and their shared innovation, it only makes sense that they will be great partners. It is a great fit for cities and towns because when the hook lift is used to its full potential it can fulfill many different needs. Filling potholes, hauling waste materials or street maintenance in the winter months are all problems that can be resolved utilizing a hook lift truck. Saving money, maximizing production, and ease of use are all attributes of hook lifts and mobile concrete mixers. The hook lift saves money by reducing the amount of trucks that a company must own because the only need is to buy the body attachments. Not only does it save money by lowering the up-front costs of purchasing more trucks, but it also saves money because each truck owned is used more efficiently. Hook lift trucks also increase productivity because they are so flexible. One may go from pouring concrete one day to dumping waste materials another. One truck, one license, and one driver; this reduces the operating expense, while expanding the services. To find out more about how a mobile concrete mixer and hook lift truck can work for you, contact a Cemen Tech concrete specialist today!